Evolution Necessary for Scientific Progress? Atheistic Darwinists have tried to hijack science with the claim that belief in God is a hindrance to scientific achievement. Even in our day when evolution rules in the mainstream of science, there are still many men and women who are doing impressive science from the perspective of belief in the God of the Bible in particular and of Theism in general. We will give two prominent examples. Consider, first, the leading personality behind the American Apollo moon mission, rocket scientist WERNHER VON BRAUN (1912-1977). Though he didn’t believe in a literal Genesis account of creation, he did believe that God created the world and that it did not arise by a purely naturalistic process. He argued that the design of the world implies and requires a Designer, and he considered it unscientific to rule out a Creator just because we can’t “test” him scientifically. 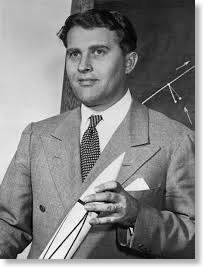 Von Braun published an article entitled “My Faith: A Space-age Scientist Tells Why He Must Believe in God.” This appeared in the American Weekly, February 10, 1963, and was republished in many other newspapers. “While the admission of a design for the universe ultimately raises the question of a Designer (a subject outside of science), the scientific method does not allow us to exclude data which lead to the conclusion that the universe, life and man are based on design. To be forced to believe only one conclusion--that everything in the universe happened by chance--would violate the very objectivity of science itself. Certainly there are those who argue that the universe evolved out of a random process, but what random process could produce the brain of a man or the system or the human eye? “Some people say that science has been unable to prove the existence of a Designer. They admit that many of the miracles in the world around us are hard to understand, and they do not deny that the universe, as modern science sees it, is indeed a far more wondrous thing than the creation medieval man could perceive. But they still maintain that since science has provided us with so many answers the day will soon arrive when we will be able to understand even the creation of the fundamental laws of nature without a Divine intent. They challenge science to prove the existence of God. But must we really light a candle to see the sun? “Many men who are intelligent and of good faith say they cannot visualize a Designer. Well, can a physicist visualize an electron? The electron is materially inconceivable and yet it is so perfectly known through its effects that we use it to illuminate our cities, guide our airlines through the night skies and take the most accurate measurements. What strange rationale makes some physicists accept the inconceivable electrons as real while refusing to accept the reality of a Designer on the ground that they cannot conceive Him? I am afraid that, although they really do not understand the electron either, they are ready to accept it because they managed to produce a rather clumsy mechanical model of it borrowed from rather limited experience in other fields, but they would not know how to begin building a model of God. “I have discussed the aspect of a Designer at some length because it might be that the primary resistance to acknowledging the ‘Case for Design’ as a viable scientific alternative to the current ‘Case for Chance’ lies in the inconceivability, in some scientists’ minds, of a Designer. The inconceivability of some ultimate issue (which will always lie outside scientific resolution) should not be allowed to rule out any theory that explains the interrelationship of observed data and is useful for prediction. “We in NASA were often asked what the real reason was for the amazing string of successes we had with our Apollo flights to the Moon. I think the only honest answer we could give was that we tried to never overlook anything. It is in that same sense of scientific honesty that I endorse the presentation of alternative theories for the origin of the universe, life and man in the science classroom. It would be an error to overlook the possibility that the universe was planned rather than happened by chance” (http://www.creationsafaris.com/wgcs_4vonbraun.htm). Thus, the world’s top rocket scientist who was a leading mind behind putting men on the moon was operating from and motivated by a perspective of Theism rather than that of evolutionary atheism. It proved to be no discernible drag on his impressive scientific achievements. In 1988, he was awarded the National Medal of Technology, America’s highest award for applied science, and a year later, he was inducted into the Inventors Hall of Fame, an honor he shares with Thomas Edison, Samuel Morse, and the Wright Brothers. 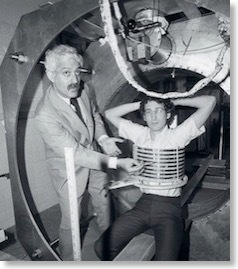 The first MRI scanner that Dr. Damadian and his colleagues built in 1977 resides at the Smithsonian Institution in Washington, D.C. Damadian is a Bible-believing Christian and attends a Baptist church in Long Island, New York.